Written by Chelsea E. Hall. In honour of International Women’s Day, I would like to highlight the literary accomplishments of living Tibetan women. Modern Tibet is witnessing an efflorescence of art, literature, and commentary created by innovative women. Although most of these works, as yet untranslated into English, will be inaccessible to the general reader, I will offer you a selection of the rich variety of modern Tibetan women’s voices, thereby amplifying them. By way of historical context, we know that Tibetan literary history suffers from an extreme lack of women’s contributions. To this day, we continue to discover old manuscripts in Tibetan. It remains a possibility that manuscripts were composed by women in Tibet, but were simply not preserved. Scholars have discovered perhaps a handful written by women. This unfortunate situation results from many factors related to Tibetan historiography (see Janet Gyatso’s Introduction to Women in Tibet for a detailed discussion of these issues). Fortunately, a recent shift in access to education and self-publishing has benefited women’s literacy and literary production. Remarkable efforts have been made to support and publish women’s writing since the early 2000s. Machik, a Tibetan NGO co-founded by two Tibetan women, Dr. Losang Rabgey and Dr. Tashi Rabgey, has been quite active in this respect. Machik supported the publication of Professor Palmo Tso’s Sholung (bZho lung), which was the first anthology of Tibetan women’s contemporary writing in Tibetan. Machik also supported the website and ongoing production of the Snowland Tibetan Women’s Journal (Gangs can skyes ma’i tshags par). This journal was also edited and produced by Professor Palmo Tso and other Tibetan women. Now closed, this early magazine provided a unique and dynamic forum for Tibetan women writers to discuss compelling social issues such as the impact of HIV/AIDS on Tibetan women. Twelve issues were produced since the journal was launched in December 2004. Machik also opens new spaces for Tibetan women’s voices through initiatives such as Mother’s Wish which helped to grow the community of women highly literate in Tibetan, with over 100 women graduating with college degrees so far. This spring, Machik will launch a Gender Essay Contest in Tibetan, with a special focus on encouraging Tibetan women to write. Just in the past few weeks, a new series on Weibo called Women’s Conversations on Books for Losar, in honor of Tibetan New Year, has published a number of Tibetan women’s book reviews. The books are chosen by the women themselves. Genres include fiction, non-fiction, memoirs, and religious (i.e., Buddhist) works. Curating their own voices by creating entries that display their names, their reflections about the books they chose, and a picture of themselves as a visual self-representation, these women are adding their voices to contemporary conversations about literature. There are reviews of internationally famous books such as Malala Yousafzai’s memoir I Am Malala. Some books are in English or other languages that these Tibetan women have learned, and some are read in Tibetan translation. Not only does this novel series give us a sense of the thirst for shared knowledge and conversation among Tibetan women, as evidenced by the desire for translation and the creation of commentary on such well-known international works as I am Malala, Women’s Conversations on Books for Losar is also a great example of Tibetan women engaging in authentic self-representation and literary expression on the international stage of social media publishing. In the realm of living communities of Tibetan women religious, which is the focus of my dissertation work at Serta Larung Gar, we can also see a contemporary efflorescence of arts and letters. Serta Larung Gar and the Five Sciences Buddhist Institute in Kham Karndzé stand out from the fold for their remarkable population of elite educated nuns and female cleric-scholars (known in Tibetan as Khenmos). Last year’s graduating class consisted of approximately 80 new Khenmos – Tibetan women who will all become teachers and community leaders. The production of female-authored texts currently underway at Larung Gar is absolutely unprecedented in Tibetan history. For example, a group of Khenmos organized and secured local government funding, founding an NGO in order to research, collect, and compile a virtually comprehensive corpus of women’s life writing. This NGO is named Arya Tāra, after the female deity Tāra, and the initial set of writings was an impressive 15 volumes long, entitled Lives of Great Female Masters from India and Tibet: The Garland of White Lotuses. The most prolific woman commentator on the classical scholastic Tibetan Buddhist curriculum is Khenmo Yönten, who comes from a small semi-nomadic farming village in Yulshul County. A quiet, humble, and unassuming figure, she is a product of the intensive scholarly atmosphere at Serta Larung Gar. 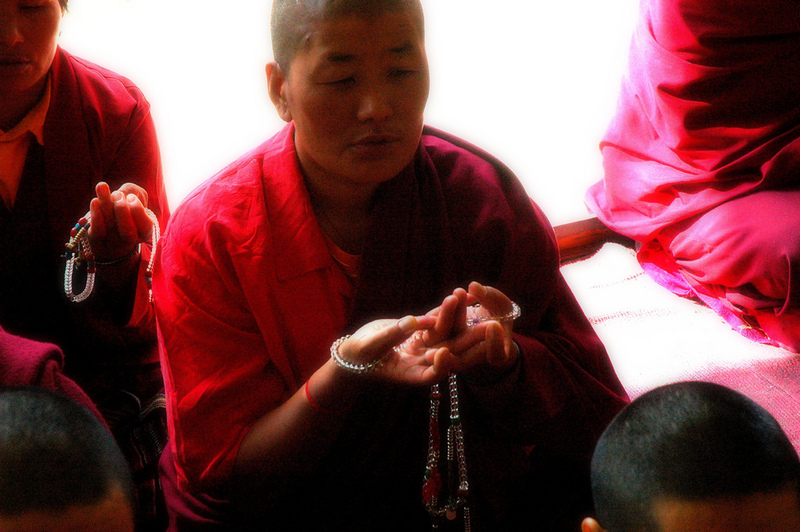 Khenmo Yönten is also a unique exemplar among nuns, in terms of her educational attainments, her composition of extensive and erudite commentaries, and her status as the first female and/or nun to compose commentaries on what Tibetan Buddhists refer to as the “Six Great Texts.” Khenmo Yönten currently teaches the most advanced class on Tibetan Tantra at the Institute. After teaching on the root texts and the major commentaries of the Larung Gar Buddhist curriculum for many years, she became inspired to write commentaries, offering her own personal counter-arguments buttressed by traditional Tibetan sources. For those unfamiliar with the extensive Tibetan commentarial tradition, this is no easy feat, and involves knowledge of a huge body of exegetical material. Thus far, Larung Gar has published six sets of Khenmo Yönten’s commentaries, making her the most-published Tibetan female cleric-scholar in recorded Tibetan history. She joins a storied tradition of Tibetan scholar-cleric commentators, the notable difference being that she is the first Tibetan woman to publish commentaries on the Great Six. This is an astounding achievement that deserves further attention. I hope that this selection of Tibetan women’s voices has given the reader a wider understanding of the scale and variety of living Tibetan women’s engagement in literary production and commentary. In forthcoming work, I intend to translate and make some of these women’s voices available to a wider audience.